File25 - Smith Lithograph Co. Ltd., New Plant, Lulu Island, B.C. ItemLF.00462 - Smith Lithograph Co. Ltd., New Plant, Lulu Island, B.C. ItemLF.00469 - Exterior of the Smith Lithograph Building, Lulu Island, B.C. 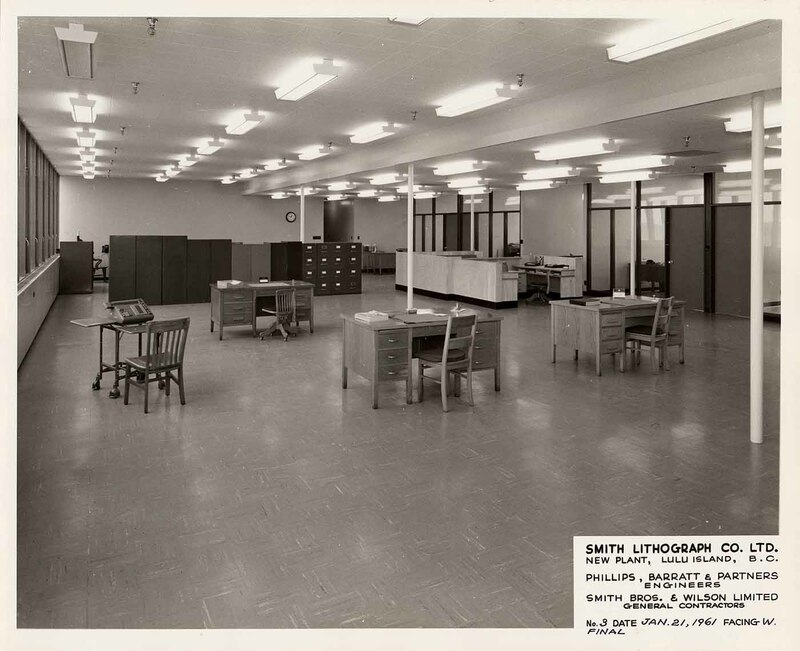 Smith Lithograph Co. Ltd., New Plant, Lulu Island, B.C. Photograph depicts the completed construction of the new plant of Smith Lithograph Co. Ltd. on Lulu Island. Interior shot of office area with three large desks, one small desk, and cubicle area; separate offices in right of image; filing cabinets in background. Title box in bottom right corner reads "SMITH LITHOGRAPH CO. LTD. NEW PLAN, LULU ISLAND, B.C. ", "PHILLIPS, BARRATT & PARTNERS ENGINEERS", "SMITH BROS. & WILSON LIMITED GENERAL CONTRACTORS", "No. 3 DATE JAN. 21, 1961 FACING W. FINAL"